Libby Hathorn is an award winning poet and author of more than fifty books for children and young people, as well as books for adults. Translated into several languages and adapted for stage and screen, her work has won honours in Australia, United States, Great Britain and Holland. Richard Flanagan’s The Narrow Road to the Deep North is set in 1943 about Australians in a Prisoner Of War camp who are set to work on the back-breaking, nigh impossible building of the Burma Railroad. It is a brilliantly written piece about war and its cruelties but also compellingly tells of friendship and love. On a much lighter note and once again, I am reading Rudie Nudie by Emma Quay to my granddaughters. For sheer beauty of venue Woollahra has to be up there, but the NSW State Library is hard to beat for its ambience and history, its reading room and its sense of excitement even in the café and bookshop since the rejig of the foyer. There is a supreme sense of our past, the immediacy of here and now with current exhibitions and for me, an energy in such safekeeping and inspiration about our future. What's the strangest thing you've ever read about yourself or your work? The publisher in Holland who first translated and published my books there had a bio (albeit in Dutch) that said I was born in Newcastle, England and came to Australia as a child when in fact, much as it sounded more exotic to be born overseas, I was born in Newcastle, New South Wales, just up the coast from Sydney! My grandmother’s advice, who set the example for me and always indicated beautifully, that poetry matters; and my advice to self some years back to try to read a-poem- a-day just like I try to set out for a walk a day. Both activities are restorative, often inspiring and thought provoking, and can be adventurous and rewarding. What drew you to the subject matter of your latest book? A Baby for Loving, illustrated by Tamsin Ainslie and Outside, illustrated by Ritva Voularis (both HardieGrant/Egmont/Little Hare, to be published in 2014), are unashamedly influenced by my grandchildren – Ruby, Isabel, Harriet and Georgina, who range in age from 1 to 9 years old. Working on these titles were bright lights in my writer’s day as I have been immersed in a much more sobering work for the past three years, my Anzac novel Eventual Poppy Day to be published in 2015 by HarperCollins. 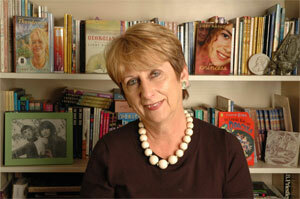 Want to know more about the work of Libby Hathorn? Libby’s latest stories include A Boy Like Me, a story about peace, illustrated by Bruce Whatley; young adult novel Fire Song; and Women's Work, a collection of contemporary women's poetry.